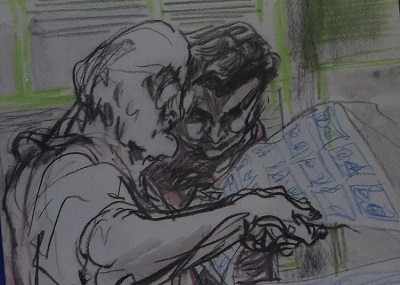 The Bank of England Museum presents a new, free exhibition which features a collection of works by expressionist artist Feliks Topolski (1907-1989). 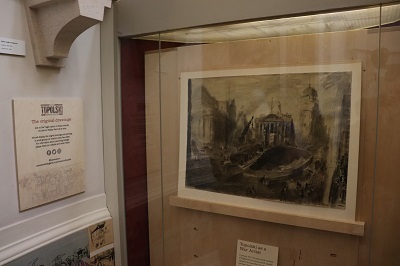 The exhibition entitled Feliks Topolski: Drawing Debden highlights works from a set of 27 drawings and paintings by Topolski, commissioned by the Bank of England in 1957 to mark the opening of its new Printing Works in Debden, Essex. Feliks Topolski was born in Warsaw, Poland, in 1907 and settled in Britain in the 1930s, he became well-known for his war drawings and paintings. 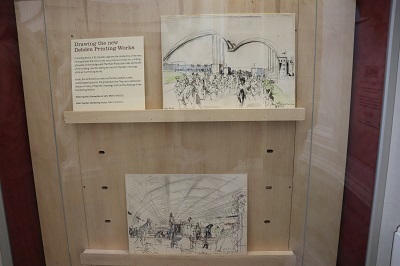 In 1958, Prince Philip commissioned Topolski to paint a mural of Queen Elizabeth II’s Coronation at Buckingham Palace and he became famous for his portraits of cultural figures, Topolski’s subjects included Mahatma Gandhi, George Bernard Shaw, Winston Churchill, Martin Luther King, Alec Guinness and TS Eliot. 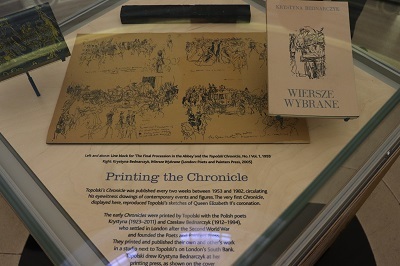 The opening of the new Debden printing works in 1956 was an important occasion for the Bank of England and in 1957 they commissioned Topolski to create an illustrated record of the building, its staff and the process of creating banknotes. 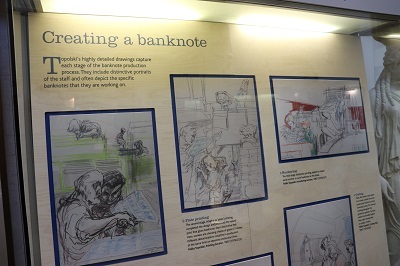 The exhibition features a number of Topolski’s work including views from the inspectors’ galleries, across the different stages of banknote manufacture. He captures a variety of printing techniques including both lithographic and intaglio printing, as well as numbering, cutting and examining the finished banknotes. Topolski captures some of the processes but also produced studies of individual machine operators, sheet checkers and note counters at work. The new printworks provided employment for many of the people who had moved away from London’s Blitz-damaged East End to Essex. 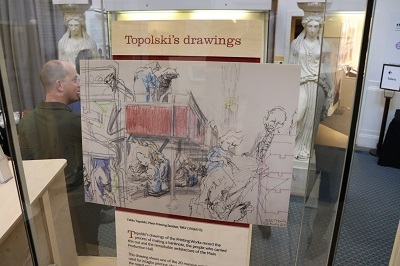 Topolski shows the workforce at work but also at leisure, playing table tennis in the recreation hall and knitting, drinking tea and reading in the canteen. The Printing Works’ distinctive building was specially designed by architect Sir Howard Robertson (1888-1963), along with structural engineers Ove Arup to increase the efficiency for the banknote-making process. Topolski’s work records the vast arches of the Production Hall roof from the inspectors’ gallery which offered an overall view of the factory floor. 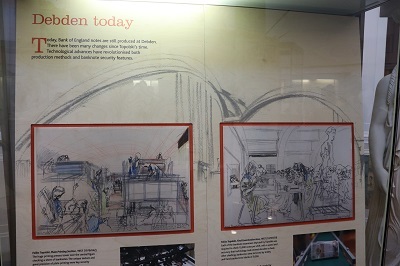 The exhibition also includes photography of Debden since the 1950s and examples of the individual notes under production. 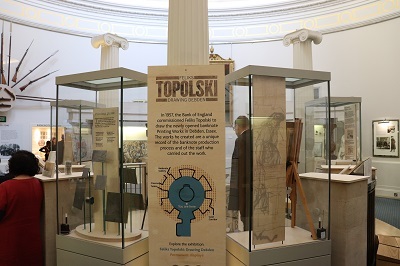 This fascinating exhibition allows visitors to view a number of works by expressionist artist Feliks Topolski commissioned by the Bank of England. 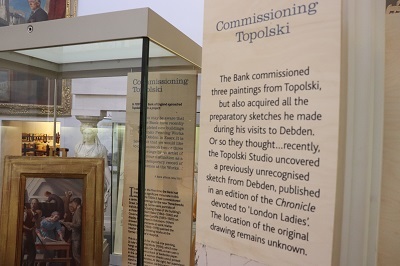 On the surface, the commission seemed unusual, Topolski’s expressionist pictures were not widely popular and the Bank of England was considered in the 1950s rather old-fashioned. Whatever the reasons, the works until now seem to have been quietly forgotten rather than celebrated. This exhibition brings to light a number of works that highlights Topolski’s skill for creating scenes of movement and humanity. 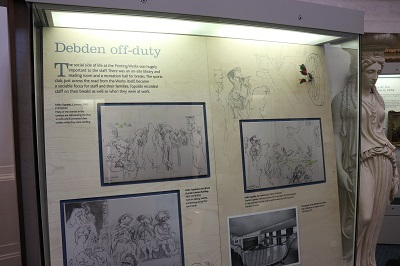 He manages to move beyond the often boring and repetitive processes of the factory floor and show something of the vitality of the people who worked at Debden. Visitors to the free exhibition can also look around the rest of the Bank of England Museum which tells the story of the Bank, from its foundation in 1694 to its role today as the United Kingdom’s central bank. weekends, except for special events taking place on those days.